"Bigfoot research" is a term loosely used to describe any efforts to probe or explain the reports and physical evidence associated with bigfoots. Over the years several different theories have been offered. Some of the more common theories are: 1) fear manifestations, 2) misidentifications of bears, 3) paranormal / UFO-related, 4) the Collective-Memory hypothesis, 5) the Bigfoot-Giganto hypothesis. Bigfoot advocates as well as informed skeptics generally do not believe a hoax is responsible for this phenomenon, primarily because the observations extend so far back in time. The patterns among eyewitnesses are not demographic, they are geographic -- they are not reported by certain types of people, rather by people who venture into certain areas. This simple pattern suggests an external cause. No matter what that cause is, it is important to understand, and not just because of the potential behind the most likely explanation. Bigfoot researchers generally lean toward one explanation: The Bigfoot-Giganto Theory (hypothesis). 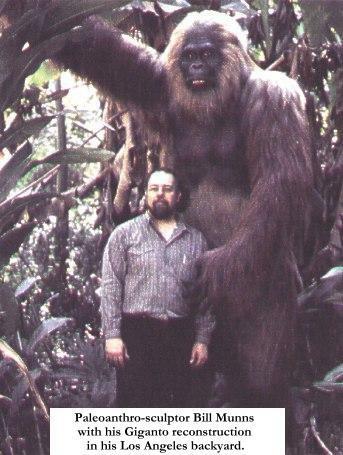 The subject of Gigantopithecus has attracted an increasing amount of interest anthropologists and primatologitsts over the past few decades. The Bigfoot-Giganto hypothesis suggests that bigfoots are surving relatives of the genus Gigantopithecus. Gigantopithecus (the Latin word for "Giant Ape") was a giant cousin of the orangutan. It was presumed to be extinct. Click on the figure to the upper right to see a chart showing the place of Gigantos in primate evolution. Bigfoot-Giganto theorists deal with a few issues that affect the potential linkage of modern bigfoot reports to ancient Gigantos. Probably the most crucial question concerns whether Gigantos walked upright. There is more than one school of thought among anthrolopogists regarding this issue. Some physical anthropologists interpret the scant fossilized remains to indicate an upright walking ape, measuring an impressive nine feet tall, and weighing more than 1000 pounds -- the general description of bigfoot type creatures reported for centuries in North America and Asia. 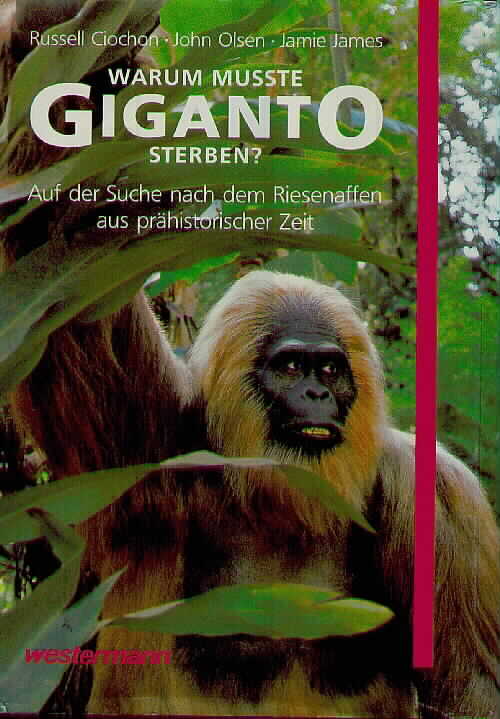 Even if Giganto posture is uncertain, no one can reasonably dispute the conclusion that Gigantos were the largest primates that ever walked the earth. Bigfoot-Giganto theorists believe that Gigantos' large brain size (perhaps the largest in the terrestrial animal kingdom) and upright-walking posture facilitated their dispersion across Asia and North America. Thousands of years of adaptation to temperate and mountainous climates, it is believed, would have given these large upright walking apes the ability to tolerate cold temperatures, climb through deep snow, and cross high mountain ranges with relative ease. There is some physical evidence to indicate that Gigantos in Asia were hunted and eaten by Homo erectus (ancestors to humans that lived contemporaneously with Gigantos). The mainstream explanation for the apparent disappearance of Gigantos lays blame primarily on this predation by Homo erectus. Bigfoot-Giganto theorists do not accept the idea that a highly mobile genus like Gigantopithecus could have been completely wiped out by Homo erectus. Instead they look to consistencies in present day bigfoot reports and see the necessary behavioral adaptations which would have allowed the Giganto line to avoid extinction at the hands of man. Bigfoots are typically sighted in or near remote wooded, mountainous, or swampy areas. They are rarely seen far from the cover of trees. If they encounter humans during daylight hours they tend to retreat and vanish into the forest. They seem to be most active when humans are least active -- late at night. Unlike mountain gorillas, bigfoots are never seen in large groups, and they don't stay in the same place for very long. The ellusiveness of these modern mystery animals may stem from their bad experiences with pre-humans in Asia. Over the past 500,000 years hominids gradually emerged from the thickest forests and began to organize into more stationary settlements. Gigantos remained semi-nomadic in the thick forests. Small family groups of Gigantos were widely dispersed in these forests. This dispersal provided more reliable foraging. It also made quick, quiet evasion much easier. Small Giganto families of 2-4 wandered nomadically through vast forests. The territories were usally remote, but sometimes bordered human settled areas. After thousands of generations they developed some amazing evasion/defense mechanisms and behaviors, including night vision abilities. They also developed powerful vocal abilities, which allowed them to locate and interact with others of their kind. They made powerfully loud screams and howls that could be heard for miles in the dead of night. Late hours allowed them to avoid various undesirables: human dangers, overheating, water loss, and the worst insects. The night time vocalizations, and occassional tracks, were usually the only things noted by humans in the area. The most commonly heard argument against the Bigfoot-Giganto hypothesis is that "we should have found their bones in North America by now..." This argument is, in fact, weak when one considers that very few remains of Gigantos have ever been found in Asia, where they were much more abundant. Tens of thousands of years of Gigantos' accepted existence in Asia would have produced literally millions of Giganto skeletons, yet the volume of collected remains from Asia is so small that the entire collection could fit easily in one suitcase. One flavor of the Bigfoot-Giganto hypothesis suggests that bigfoots might not be direct descendants of the genus Gigantopithecus, but rather some other offshoot of the giant Asian "wood ape" line, perhaps a line for which we have zero fossils remains at the present time. The Giganto line is an important reference point for this alternate explanation for two reasons: 1) the Giganto line illustrates the potential for primates to grow to such 'gigantic' proportions (twice as large as the largest 'known' living primate), and 2) the fact that so few remains of Gigantos have been unearthed and identified makes it more conceivable that there could have been other lines of giant Asian wood apes for which we have no fossil remains at the present time. People often assume that bones of a wild animal are present and available long after the animal's death. Many people assume that wild animal bones always become fossilized. The fact is bones become fossilized or otherwise preserved only in the rarest of circumstances. Without fossilization or preservation, bones of wild animals will, in time, become completely reabsorbed into the biomass. We would literally be climbing over piles of animal bones if they were not naturally recycled. An animal carcass in a dense forest will be reabsorbed relatively quickly through weathering, decay and scavenging by other animals and insects. The odds are very very poor that bones of a rare, elusive, forest dwelling species will be found in some recognizable form by a hiker cruising along a trail. No research group has ever made an attempt to look for Giganto bones in North America, so no one should be surprised that Giganto remains have never been identified in North America. Ironically, the most vocal skeptics and scientists who rhetorically ask why no bones have been located and identified on this continent are the last people who would ever make an effort to look for them. Some Bigfoot-Giganto theorists speculate that fragmentary remains of Gigantos have been unearthed in North America in the past but were simply disregarded or misidentified. The second most common argument against the Bigfoot-Giganto hypothesis asks " Why haven't hunters shot one in North America yet ? ..." The reasons are more obvious than most people might realize, and there's enough of them to make a separate article on that topic. The third most common argument against the Bigfoot-Giganto hypothesis asks " Why aren't there more photos of these modern Gigantos ? ..." This question is also addressed in a separate article.